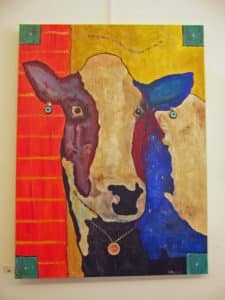 Northeast Georgia is a little hotbed of creativity with an abundance of talented artists and artisans, and Soque Artworks in Clarkesville, Georgia, is a prime showcase for many of them and their work. Opened in 2008 by Rush, Susan and Walton Smith, the gallery was created specifically to present the art and works of artists who live in Northeast Georgia the adjoining states. Soque Artworks features nearly 80 artists in 25 different mediums. Many are members of prestigious regional art organizations—such as the Southern Highland Craft Guild—teachers at the John C. Campbell Folk School or graduates of Penland School of Crafts. The gallery, which sits right on the downtown square, is an excellent stop when you’re shopping for special holiday gifts, as it offers a treasure trove of items. Here you’ll find handcrafted baskets, birdhouses, Christmas ornaments, folk art, paintings, pottery, wood carvings, wreaths and other art and artisan pieces. You just may need to buy a gift for yourself too! Tuesday – Saturday, 10:00 a.m. – 6:00 p.m.
Clarkesville is on the Soque River, just a 20-minute drive from Lucille’s Mountaintop Inn & Spa. We’re getting all decked out for the season, so come and enjoy the festive atmosphere. Call today for a reservation—or book online! IMAGES COURTESY OF SOQUE ARTWORKS. 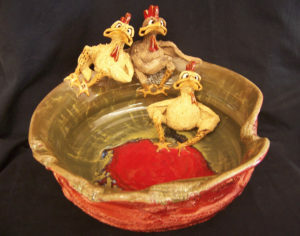 This entry was posted in Art, Georgia Bed and Breakfast, Georgia Mountain town, Holidays, Shopping and tagged Art, Christmas Shopping, Folk Pottery, Georgia Bed and Breakfast, Georgia Mountains, Mountain Crafts by admin. Bookmark the permalink.